Our ODBC drivers support unixODBC and iODBC, the most popular driver managers for Unix/Linux environments and Mac OS X, giving you unprecedented access to your Big Data, NoSQL, and SaaS sources from ODBC-capable tools and applications, no matter what operating system you use. This article will walk you through the installation and configuration of any of our ODBC drivers on Mac OS X, Red Hat Linux, and Debian-based Linux environments like Ubuntu. 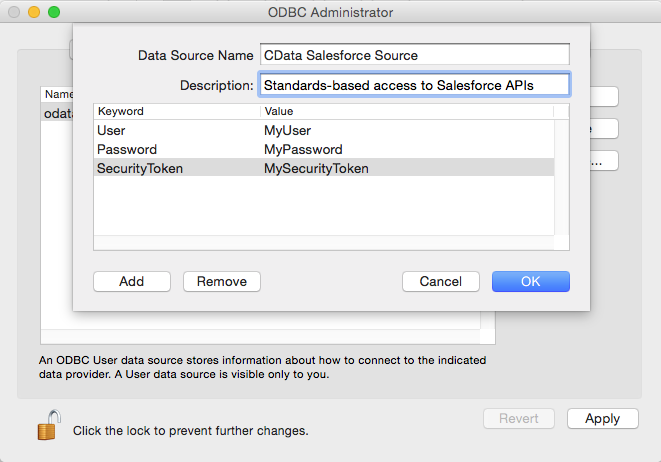 The ODBC Driver for Salesforce is used as an example. See the "Getting Started" section in the help documentation for the libraries required by the driver. Before installing the driver, you need to be sure that your system has a driver manager. unixODBC is a free and open source ODBC driver manager that is widely supported. iYou can downloading the driver in standard packages formats, the Debian .deb package format or the .rpm file format. Once you have downloaded the file, you can install the driver from the terminal. The driver installer registers the driver with unixODBC and creates a system DSN, which can be used later in any tools or applications that support ODBC connectivity. Define the required connection properties in sections of an odbc.ini file. The section name is the DSN. Refer to the "Getting Started" section in the help documentation for more information on the connection properties needed to connect to your data source. You will also need to set the Driver property to the name of the driver as defined in the odbcinst.ini. There are several options for user-friendly interfaces when it comes to configuring ODBC data sources on Mac OS X. However, a GUI still relies on an ODBC driver manager. The CData ODBC drivers are preconfigured for the iODBC driver manager, as are many other products like Filemaker Pro and Microsoft Excel for Mac. This makes the driver easy to use with these tools. Another driver manager, unixODBC, is widely supported by scripting languages like Python and Ruby. For a guide to creating and testing DSNs with unixODBC, see the "Getting Started" section in the help documentation. You can find the latest version of iODBC on the iODBC site. The iODBC installation installs its own GUI, the iODBC Administrator. It is this tool that is used in the following procedure to create a DSN. Installing a CData ODBC Driver registers the driver with the iODBC driver manager, so the only remaining step is to use the iODBC Administrator to supply the necessary connection properties in a DSN. The driver installation automatically creates a system DSN. System DSNs can be accessed by all users, while user DSNs can only be accessed by a single user. However, modifying a system DSN requires elevated permissions. On the System tab, select CData Salesforce Source. Click the Add button to enter connection properties as key-value pairs. For more information on the connection properties needed for your data source, refer to the driver help documentation. odbci.ini - The file used to define individual ODBC data sources. odbcinst.ini - The file containing the ODBC drivers registered with the driver manager. With iODBC, drivers can be available to only one user account or the drivers can be available to all users in a system, as with DSNs. You can modify the files at the paths below, depending on the level of access you want. For specific information on using these configuration files, please refer to the help documentation included in the installation of the drivers. To download free 30-day trial versions of any ODBC Driver, select an ODBC Driver data source on our driver listing page, and navigate to the download page.